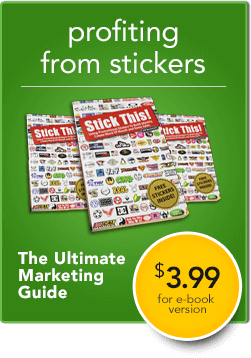 The following interview is an excerpt from my new book Stick This – Using Promotional Stickers To Build Identity, Create Word Of Mouth and Grow Sales. 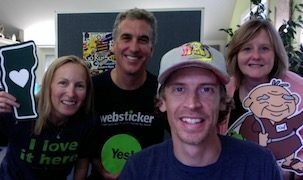 It is one of several interviews with businesses and organizations using stickers effectively in their marketing campaigns. The Feel Your Boobies Foundation (a 501c3 non-profit organization) gives away thousands of free stickers as part of its ‘reminder campaign’ to encourage breast awareness among young women. They have been spreading their message with stickers since 2004 and according to founder Leigh Hurst, “stickers are a great way to start a playful conversation about an important topic.” Many of the stickers have directly resulted in early detection of breast cancer and have saved lives. Jeff: How do you get your promotional sticker into people’s hands? Leigh: We use stickers in all kinds of ways. When attending physical events, we have small stickers that we give out to people to wear on their shirts. These stickers are a great way to open up a conversation with people who walk up to our table at vendor events and they spread our message as those who wear them walk about the event. We also have given away free stickers through social media to drive traffic to our website and to encourage people to vote for us in social media contests that help us win funding for our campaign. Jeff: Your name, artwork and over all campaign is a bit unconventional and provocative. How does this lend itself to an effective campaign and the spreading of your message? Leigh: The guiding principle of our campaign is “a friendly reminder when you least expect it”, so all of the outreach methods we choose are meant to put our message in a place where you wouldn’t necessarily expect to be reminded to feel your boobies. We focus on a proactive message that goes beyond just a pink ribbon or a tongue in cheek slogan. Many of those approaches tend to be passive in nature, in that awareness alone does not change behavior. Our sole goal is to put our “feel your boobies” reminder in front of young women, in an effort to get them to be more proactive with their breast health. When a friend gives you a sticker, texts a photo of our “boobies bus,” or shares a graphic on Facebook — they are doing the reminding (therefore it’s friendly), which is much different than the more clinical/medical reminders young women often receive at their annual exams or from authority figures. It’s provocative, proactive, and it’s working… as evidenced by the testimonials we have received. We see our stickers and magnets all over the country. Our followers often post on Facebook photos of stickers they have seen and it’s great to see the message spread in this way. When someone is moved to want to take a photo and share it, we have motivated them to pay attention, at some level, to the message. Our car magnets are, hands down, the most popular item we sell in our store, and the purchase usually comes after someone has seen the magnet on a car somewhere. Yes, our magnets and stickers have literally saved lives. 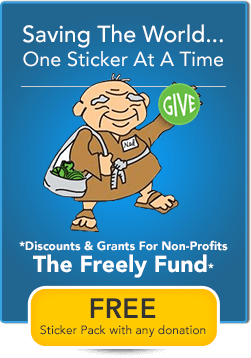 Jeff: Do you think you get more marketing value out of the giving and selling of the stickers, or more in the impressions and conversations that take place once displayed out in the world? Jeff: How would you rate the overall value of using promotional stickers in your marketing mix? Leigh: In terms of revenue, I don’t think we see as much of a return on stickers because people perceive them to be more of a giveaway. Having said that, stickers are a major part of our campaign and because they are inexpensive, we can give them away for free much more affordably and make much more of an impression than any other items like t-shirts, etc. I would always choose budgeting more money to give away more free stickers over paying for advertising any day. 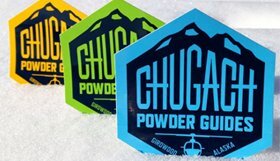 Jeff: Any final thoughts or advice on using promotional stickers? Leigh: I don’t think I initially expected the stickers to be so good at starting conversations with people. When out at events they really help to break the ice when people wander over to our table to find out what we’re about. It’s a lighthearted way to say hello and to provide them with an important reminder that also has our brand and URL on it. Even if that is as far as the dialogue goes, we have done our job. My biggest piece of advice related to the use of stickers in spreading a message is to keep the design & messaging simple. If it takes too long to decode what the sticker says, you have lost a great opportunity to put your brand or message in front of someone. Promotional stickers can travel to unexpected locations, starting conversations wherever they go. Stickers don’t necessarily need to be applied somewhere to start conversations. And, conversations aren’t necessarily needed for stickers to make an actionable impression. Don’t forget car magnets, another form of “sticker” (without adhesive). They can have a higher perceived value and stronger attraction to certain demographics. They may not necessarily be used as a freebie, but if they can be sold as product and still effectively spread a message – that’s gold! And, all the more essential for your marketing tool box. Keep designs and messages simple. And, when possible make messages proactive as opposed to passive. The Feel Your Boobies Campaign is a perfect example of the power a simple sticker can have. They are raising awareness and saving lives!